This uItimate cotton custom hooded sweatshirt features set-in sleeves and a front pouch pocket. Get your company name out there with Hanes promotional clothing from ePromos. We carry sweatshirts and t-shirts for adults, children, and even babies that can be imprinted or embroidered with your company name or logo. 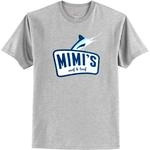 Our custom t-shirts are great for company outings, sporting events, and everyday use, so your business is sure to get great exposure when recipients wear these shirts out.